Is your birthday between 2nd August 1995 and 25th July 2002? If so then Roverway is for you! Up to 3,000 young people aged 16 – 22 will participate in the Roverway, coming from across Europe. The participants will be divided into international teams, called Tribes, with whom they will collectively take part in the Path of their choice. The Paths are located across the length and breadth of the Netherlands and will each have a different theme reflective of the area. The participants will spend several days on their Paths, taking part in community projects and learning more about the culture and history of the country. 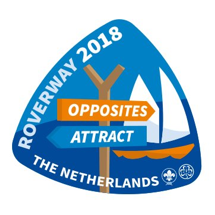 After completing their Path, the participants will travel to International Scout and Guide Centre Zeewolde for a jamboree style camp, the central camp will take place for the last part of Roverway. During the event, young people from all over Europe will come together to work on shared projects and learn more about themselves, the environment and others. If this sounds your kind of activity, please download the application form from here Ashdown-Patrol-Application-Form.pdf	(156 downloads) . There is additional information available to download from here Roverway-2018-Participant-Presentation.pdf	(120 downloads) and if you are interested in applying for the a Patrol Leader role, you can get more information about this role from here PL-Role-Description.pdf	(111 downloads) .